Forecast: Sunny skies are expected for the next 7-10 days. We have very warm temperatures for the next couple of days. High temperatures are expected to be between 88°F and 93°F Sunday and Monday. Tuesday we return to the low-mid 80's as we start to cool down. Wednesday through next weekend we will top out in the mid-upper 70's for high temperatures, and lows in the 50's. The official record for Sunday at Sea-Tac is 92°F so we may tie or break that record. Last week, Thursday we just touched 90°F in Shoreline which makes it our fourth day this year with a high temperature of 90°F or more. Last year by this time we had only touched 90°F once, on June 25, 2017. It's very different from Sea-Tac which has not yet recorded a high temperature exceeding 90°F this year. These temperature differences are very indicative of how localized our weather can be. 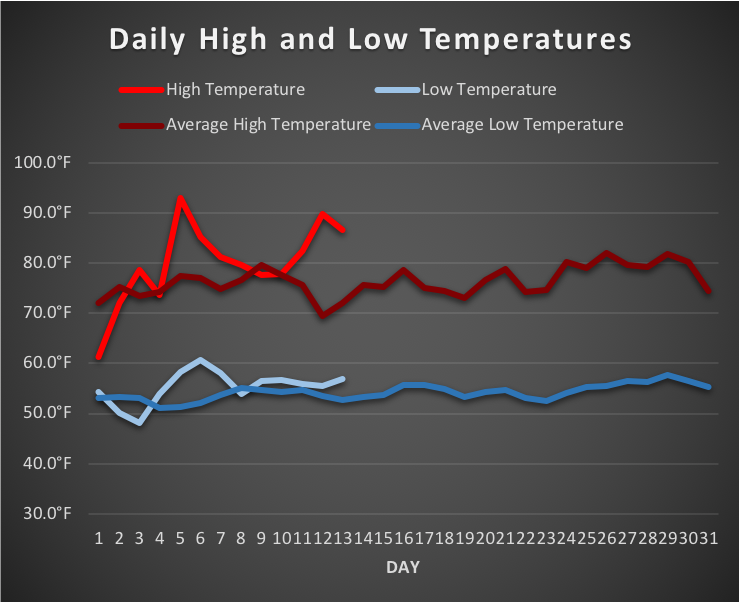 Below is the daily high and low temperature graph compared to normal in Shoreline.